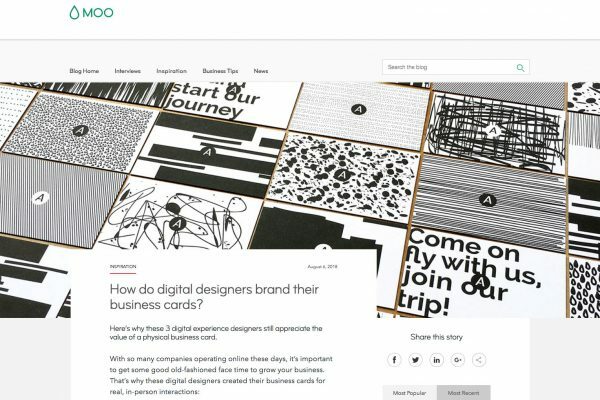 We are thrilled to be showcased by MOO on their Inspiration blog! They interviewed us about what we do, how we do it and the results we obtain. Our business cards are the centerpiece of the article, showing how we translated our differential value and unique proposition into the design: at Aeronave visual we offer unique experiences, just like our cards. There’s no two alike. Every client and project are different, and the creative processes we perform are tailored to their specific needs. We created each card with a different monochrome pattern (yes, we designed them one by one! ), and the outcome was beyond expectations: everybody wants to have a card, and the moment of picking one from the pile is unforgettable. What better result could we possibly ask for, than to have an unforgettable card?